Tags in UPilot significantly expand how you can customize your contacts by grouping them together the way you would like to. They can be used to filter your contacts by country, or whether they are decision makers in their organization, or in any other way you would like. 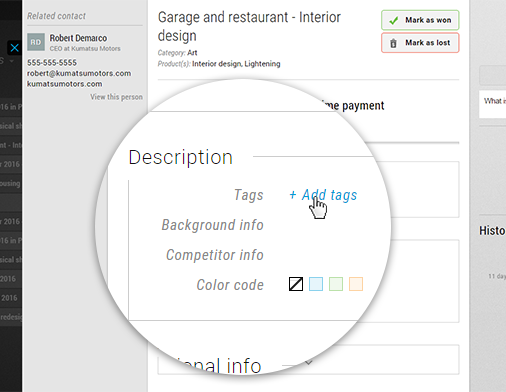 You can create and add your own tags for each of your contacts and deals. Open the contact where you would like to add a Tag. This can be either a person or a company. ’Tags’ are located in the section “Description”. Click on ‘Add tags’. This will open the Tags popup. Select the Tag(s) you want. You can select multiple Tags. Alternatively, you can also create a new Tag in this box itself. Click ‘Assign Tags and Close’. Your tag(s) has now been added to the Contact. If you feel that a Tag is no longer required for a contact, you can remove each of them as and when you would like. 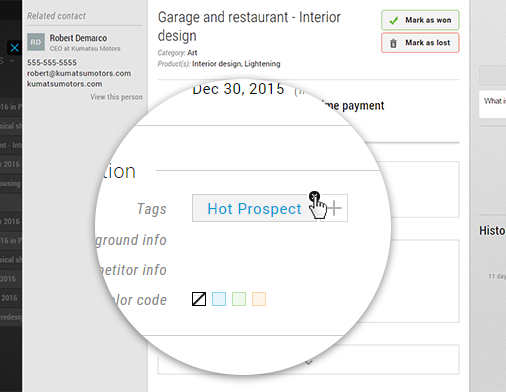 Your Contact table will now show only the Contacts tagged with the selected tags.